perhapablog... and other ramblings: technically, it's still friday...david petersen!! sorry for the delay--it was a loooooong day. at the end of a looooong week. today was too-many-errands-to-do day, but before alla that; anyopne who lives in the northeast knows that the past week ar so has been bitter cold with temps around 20º to 30º by day and down below zero at night. my pipes have been frozen for the past four days and it has made everything that much harder. the caretaker assures me that he'll have 'em all thawed out by tomorrow which is great 'cause i'm gettin' tired of going over to my brother's to shower. 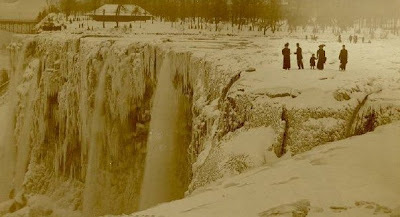 apparently it got so cold in 1911 that niagara falls froze over. awesome! also, on my list for today was to go get a certificate of residency at the county court house, get copies of that as well as the certificate of inspection from my local garage. and the ticket i got for the inspection being overdue. drop off the ticket and the coi at the rhinebeck town court. go and pick up my college transcripts and a form to apply for independent study for the theater class i'm taking. take the form to my professor's house so he can sign it (he told me to forge it, but i wanted to see his house...). drop off the latest perhapanauts for my friend, beth. 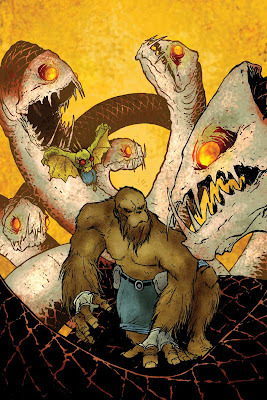 drop off the latest issue of the perhapanauts at my cousin joann's house. pick up a gift certificate for trish at barnes and noble (in place of the book i got her for christmas which craig got for her too...great minds...or a couple of jerks...?). and as a treat to myself after alla that running around, i swung by october country, my absolute favorite comic shop within 40 miles of my house, and picked up a few of this weeks books! also in there was the new paul dini detective (thank you for bringing back the batman that all we know and love, paul! he was away for far too long!) 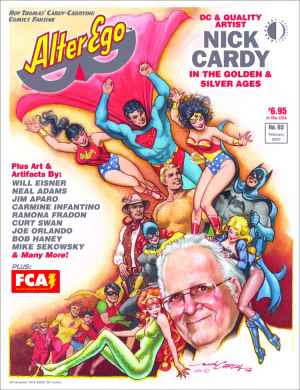 and astro city: dark ages book 2! and though i had it on my list since way back, i will mention that dave tilley highly recommends jeff smith's spectacular new shazam! book! and, because i hadn't been in last week to pick it up, there was also issue 6 of david petersen's stunning mouse guard! 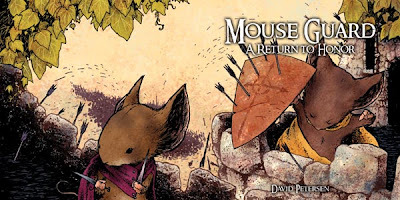 not that the book didn't hit the comics scene like a meteor last year or that issue one is now in it's, like, ka-billionth printing, but if you haven't seen mouse guard yet...well, you're an idiot. david's gorgeous tale comes to it's conclusion with this issue (and i haven't read it yet so shut up!) and while that's always sad (there's more coming, i'm told), david was kind enough to provide us with a pin-up of his own that will be featured in the second chances trade pin-up gallery! as you can see, david was drawn to big and choopie too! thanks, david! not only for the pin-up, but for mouse guard as well! what a beautifully done story--sure to be counted as a classic! 1. what is the name and number of the flight that crashed on "lost"? 2. the joker was loosely based on the title character from what haunting classic film? 5. what are the 5 D's of "dodgeball"? Yeah it's been colder than normal around here since the middle of January, but it should be breaking soon. As for Mouse Guard, I missed the first couple of issues, so I decided to wait on the trade and from what I hear, it will be well worth the wait. I didn't see Alter Ego when I was at the LCBS, so I'll look for it next time I'm in because if the interior is half as good as that cover, it will be well worth the price of admission. Now on to the five for friday. I just ordered the Mouse Guard hardcover. It's in the latest Previews. I just didn't want to deal with any more floppies, especially with a book my kids might enjoy. The pin up looks great. They all look great. But, why no love for Arisa. No one was inspired to do a ladies of the Perhapanauts pin-up. Not that we should complain. The pin-ups for this trade are off the scale cool. Fine, I sucked it up on trivia this week. But, next time I tells ya. Next time. Also, everyone out there should watch Friday Night Lights. Just as good as Battlestar, except instead of space battles, they play football. Scott, in regard to Arisa, I believe that it was specifically put into his contract that ONLY Craig is allowed to draw her. I have been lead to understand by a reliable source that this is somehow related to the reason why a certain writer and artist were drawn into "The Perhapanauts, Second Chances" and the reason why the release was pushed back from February 7th to Valentine's Day.